To stop a simple Scandi table from looking too stark, lots of greenery is a must. You can keep spending to a minimum by foraging for as much as possible. I collected a few of different types of fragrant fir and small pinecones on dog walks - keep your eyes peeled - there’s also plenty of holly and ivy about too. You can then get a bunch of eucalyptus fairly cheaply from the florists, along with a few stems of thistles and roses, which all add texture and interest to your display. Scatter a few small sprigs along the middle of your table, and then create a focal point with a vase - or a jug like the one I’ve used here. A great styling tip is to work in three’s, so here, I have added two glass candlesticks to flank the jug. A tablecloth is a super simple way to add elegance to the overall look. If you don’t have one to hand, a length of linen or even a plain bed sheet will do the job! You can even leave the edges frayed for a more rustic, relaxed look. If you use glass bottles as candleholders as I have here, why not pop a small sprig of eucalyptus inside? Add a few vintage style mercury baubles to the centre that have a slight shimmer to catch the warmth and glow of the candlelight. Create a charming place setting by tying a stem of eucalyptus and thistle together, alternatively, you could use a piece of fir/Christmas tree (from the lower end of your tree) or some mistletoe. The key to this look is ‘less is more’, keep it uncluttered, simple yet sophisticated. Try layering your plates, it creates visual depth and makes the setting feel a little special. Place napkins in between the two plates to add texture, and to keep the table surface less busy. I’ve purposely chosen white plates for a more minimal look, but patterned plates on a plain tablecloth will look equally lovely. An optional, but wonderful finishing touch - add some sheepskins to your seating, they are super cosy and create a tactile, welcoming and comfy feel for your guests. *The wall hanging in these images is part of A Foraged Christmas, a mini online course that goes on sale Monday 3rd December, priced at £18 for four festive easy to follow step by step projects that include a wreath, a mantelpiece garland and a festive bunch. See Sophie’s Instagram for further details. We are all trying to do our bit to reduce plastic waste, and the kitchen is one area where you can make plenty of changes. Cling film can easily be eradicated from regular use by replacing it with waxed food wraps. You can buy these now from various retailers, but Juliet Bawden is here to show us how to make our own, allowing you to choose any fabric design you like - and I think you’ll agree, it looks much prettier than cling film ever did! Wax - either grated from a large block or you can buy wax pellets on line. Use the bowl or vessel you wish to cover as a template and draw around leaving an extra two centimetres on each side. Cut out the fabric with pinking shears so you won’t have to hem the fabric. 2. Line a baking tray with parchment paper, then place the fabric on top and sprinkle the wax evenly on the fabric. 3. Place in a low temperature oven, approx. 100°C, and watch the fabric through the oven door until the wax melts into the cloth, this should take between five and ten minutes. Remove carefully and use a paintbrush to spread the wax, covering any parts of the fabric where the wax may not have penetrated. 4. Hang the fabric up to dry. Once the cloth is dry it will still feel slightly sticky and waxy but that is the nature of the beast. You can make cloths for specific containers or larger pieces which can be multi-purpose and could wrap items such as loaves of bread or pieces of fruit. Wash your wraps after use in cool water with some gentle soap and leave to dry. Pretty foliage and greenery can make for a stunning focal point at any celebration. Whether it’s an extravagant wedding feature or a simple summer garden party, flowers are always the most striking way to create a memorable focal point. Marianne of Frances and Rose and photographer Kathryn Taylor share a wonderfully simple way to create your own handcrafted floral hoop which can add that touch of pretty creativity to any occasion. Foliage/ flowers – a mixed bucket of around 50-70 stems, if using foraged foliage make sure to condition them properly to prevent it from wilting. Flower Preparation: To condition foraged foliage and prevent them from wilting, cut the stems at an angle and make a straight cut vertically to create a slight split. Place the stems into a pan of boiling water for around 30 seconds, or until they stop releasing bubbles, and then immediately plunge into a separate bucket of cold water to cool. Leave them in there for one hour. A good tip to remember is that flowers with stronger, waxier leaves tend to work better than softer, floppier leaves for this particular project. If you are decorating for a special occasion you can also source local, lovingly grown cut blooms from the ‘Flowers From the Farm’ organization. This is a collaboration of growers and florists based throughout the UK who sell freshly cut flowers by the bucket! 1. Take the floral stem tape and wrap around the entire hoop so you have a totally green base to work from. This will give the hoop grip for the flowers and an even backdrop. Plastic hoops can be very slippery so if possible a wooden or bamboo hoop is a great alternative. 2. To start with, take your scissors and cut a collection of stems. You can make them as long or as short as you wish. However prepare these in advance before the next step. 3. Take your wire and secure it by winding it tightly at the starting point of your hoop. A good tip is to twist it a couple of times to build security. Leave the reel attached at this stage, don’t cut the wire! 4. Separately create small bunches of 3-4 stems. Hold them together in one hand and place them parallel to the hoop. Simply follow by wrapping the wire around each floral bundle three to four times to hold strongly in place. 5. Make the next bundle and lay it over the last with the stems in the same direction. You should aim for the new leaves to cover the stems of the previously secured bundle. Again wrap each floral collection approximately three to four times. 6. Continue this process the entire way around. Try to plan out your flowers as you go but don’t be afraid to get creative. Create clusters using flowers alongside simple greenery that will add beautiful contrast and balance to your design as it grows around the hoop. For this example we built the greenery and flowers around two thirds and then left space for the addition of a classic green velvet ribbon as a finishing touch. Flower Tips: If you are hoping to use a lot of flowers, it is recommended to make your floral feature as close to the event as possible to avoid wilting. Stronger stemmed flowers or even dried flowers like hydrangeas or helichrysum can make the most beautifully diverse arrangement that will also last the course. If you are really keen on using garden roses and other soft flowers out or water for any length of time, florist test tubes wired into the design can help to keep them plump and in bloom for longer. And why not get a bit experimental. Sturdy fruit tree branches such as apple tree springs or even hardy herbs can add texture and fragrance to your party piece as well as much needed structure and strength. Learn with Frances & Rose: If you fancy learning more about how to make floral hoops, crowns or bouquets using home grown, seasonal British flowers, Marianne of Frances & Rose holds group and 121 workshops from her studio in the heart of the Peak District. To find out more go to www.francesandrose.co.uk or @francesandrose on Instagram. It's no secret we love flowers here at 91! To be honest who doesn't?! Whether it's a simple single stem in a bud vase, a huge extravagant bouquet or a summer garden of wildflowers they never fail to raise a smile. 91: At The Real Flower Company you grow your flowers at your own English and Fairtrade sustainable farms. I'm sure a lot of people would not even consider sustainability when it comes to flowers, but can you explain why this is so important? Rosebie: As flower farmers, we take our responsibility to our environment and to wildlife very seriously. Our goal is to improve and enhance our natural surroundings rather than to deplete them. Our aim is to improve the soil, to encourage beneficial insects and to grow flowers as nature intended. We are members of the Farm Wildlife Advisory Group, part of the Countryside Stewardship Scheme and we are certified under the Assured Combinable Crops Scheme. Through the way we farm and grow our flowers, we want to leave our world a better place than we found it. 91: Many people probably also don't realise that most commercially grown flowers have their scent gene removed! Your passion is to ensure this gene is kept intact. Is there anything gardeners can do at home to improve the scent intensity of their own blooms? Rosebie: What is important is the species and varieties you choose to grow rather than how you grow them. For instance, I love the wonderful clove-like scent of Dianthus – my favourites include Doris, which has a nostalgic romanticism, and the pretty frills of Mrs Sinkins, Dianthus Cathusianorum which has a bright pink pretty flower and is great for cutting and Dianthus Arenarius, pure white with delicate flowers and an incredible scent. Then for me, no English garden is complete without scented roses and sweet peas. My mother and grandmother were both keen gardeners and it was the fragrant roses of my childhood that inspired me to start The Real Flower Company. In terms of scented roses, I love Chandos Beauty, Margaret Merril and Romantic Antike. 91: People always want their cut flowers to last as long as possible – what tips can you share with our readers for getting lasting enjoyment from your flowers? Rosebie: Start by trimming the stems at a 45-degree angle with a sharp pair of scissors or secateurs. Then place them straight into water, either with some cut-flower food or add a teaspoon of sugar, two to three drops of bleach and a dessertspoonful of vinegar to prolong their life. Change the water regularly and keep your flowers in a shady spot. 91: Flowers definitely seem subject to fashion. What are your predictions for floral trends in the year ahead? Rosebie: I think the big shift will happen next year when there will be a move to more bright and vibrant shades. This year it’s very understated and soft, calm and muted tones have been popular. We’ve always championed a natural, ‘just-picked-from-the-garden’ look so it’s great to see this increasing in popularity. I also think Meghan and Harry’s wedding flowers will have an impact for the rest of this year. 91: Finally, what would you have in your absolute ultimate bouquet? Rosebie: For me, it’s whatever is in season and scented – so right now I have a beautiful bunch of Lily of the Valley from our farm close by. Soon our English rose season will start and then Margaret Merril – the quintessential English rose with a scent like no other – hand-tied in a natural arrangement with wild flowers from our farm’s wildflower meadow will be taking pride of place on my table and filling my home with its exquisite scent. Thank you Rosebie! What a lovely insight into what sounds like an absolute dream career! The images that Catherine Frawley shot for us highlight how simply stunning The Real Flower Company's flowers are don't you think?! Now, to be in with a chance of winning that 3-month floral subscription worth £165 - a gorgeous seasonal bouquet delivered to your door each month (or the door of someone you want to treat!) - all you have to do is enter your details below. A winner will be drawn at random after the closing date which is 15th June 2018. This giveaway is only open to UK entrants due to the nature of the prize (see UK delivery exclusions below), and please do read the full terms and conditions below before entering. THIS GIVEAWAY IS NOW CLOSED & a winner was picked at random. Congratulations to emma boyns. 1. Only entries made before the closing date – 15 / 06 / 2018 will be valid. 3. The winner will have five working days to respond with the delivery details they wish the flowers to go to. If a reply is not received by this date, they will forfeit the prize and a new winner will be chosen. 5. The giveaway is open to UK only. The Real Flower Co can deliver to most UK postcodes but there are exceptions in the highlands and islands as it can take two days to reach by van and sadly the flowers don't suit that environment. AB37-38, AB41-56, IV1-20, IV25, IV30-37, IV63, KW1-3, KW6-10, KW14,PH15-26, PA21-35, PA37-39, PH33,49, IV21-24, IV26-28, IV40, KW5,KW11-13, FK18-21,PA36, PA40, PH30-32, PH34-41,PH50, HS1-9, IV41-56, KA27-28, KW15-17, PA20, PA41-49, PA62-76, PH42-44, ZE1-3 Northern Ireland, Isle of Man, Jersey, Guernsey, Scilly Isles. 6. By providing your email address & ticking the check boxes in the above form you are giving permission to be added to the mailing lists of 91 Magazine and/or The Real Flower Co. Your details will not be shared with any further third parties. This post was sponsored by The Real Flower Company. Images by Catherine Frawley for 91 Magazine. A mix of individual stems like grape hyacinth, wax flowers, daisies and olive sprigs create a delicate look for a table centre-piece. Add subtle colour with tinted vases, while keeping the rest of your settings soft and neutral. The vase can be just as much a focal point as the flowers are - or in this case - blossom branches. Group together a selection of interesting vessels in similar shades and fill with the same type of stems or foliage for a cohesive display. Nothing says Spring than a statement display of wildflowers! Forage for daisies, astrantia and wax flowers or buy handfuls from your local florist or farm shop and arrange loosely in a large vase. They will look great in the middle of the kitchen table or will simply bring Spring to any room of the house. Cut Out platter, £40, Lazy Glaze / all other items, stylists own. Have a bit of fun styling a floral display on a sideboard or shelf with a mixture of pots and vases in varying sizes and different Spring blooms like anemones, narcissus and grape hyacinths. Again, pick pots that are as interesting as their contents. Three-legged pot (left), £23; Candle holders, £8 each - both Elkins (Crystal Palace) / Pot (right), design collaboration between Lazy Glaze x Julianna Byrne, £65, Lazy Glaze / All other items, stylists own. A single stem or sprig can prettify your place settings in an instant, and takes minimum effort when hosting a relaxed Springtime lunch. If using coloured napkins, make sure to opt for a bloom in a coordinating colour. These deep pink astrantia look wonderful against the peachy gingham napkins. Go for an ultra-feminine, blousy bouquet of Spring flowers with anemones and tulips. A display like this will start off with a more formal look as both flowers contain their blooms neatly before they open and become loose and carefree. Here a simple, plain vase allows the unruly flower heads to take centre-stage. Today we are sharing a DIY project from new book Woodworking on how to make your own branch clothes rail for next to nothing. Apart from some lengths of leather and a few inexpensive tools, you'll just need to invest some time sourcing a suitable piece of wood and then creating and installing it - resulting in a totally unique way to store and display your wardrobe. 1 piece of driftwood, approx. 140cm (55 inches) in length. Consider the thickness of the stick as it must be suitable for your chosen hangers. STEP 01 - Comb your nearest beach for a suitable piece of driftwood, then leave your chosen wood to dry out in the sun. STEP 02 - Use the sandpaper to clean and polish the rough edges. Run the sandpaper along the stick to make sure there are no splinters or small rough knots. STEP 03 - Using the saw, cut the stick to your desired length. The maximum length would be 150cm (59 inches), to ensure the stick is strong enough. STEP 04 - Using the leather hole punch, prepare two holes in the leather around 1cm (¹⁄³ inch) inside the edge of the strap and 25cm (10 inches) from the end. You could even ask your leather merchant to cut the holes. Hammer the copper or brass nails or studs into place. STEP 05 - Loop the leather straps around each end of your chosen branch. STEP 06 - Check the exact measurement between the two leather straps and mark the two spots on the ceiling where the straps will be attached. Drill holes in the ceiling for the screws and attach the straps to the ceiling. The branch could literally be hung using any material: rope, rough twine, coarse fabric, even an old fine silk scarf. You can hang it next to a wall as a sort of separate closet, but it also works beautifully as a room divider. And while it’s perfect for holding your clothes in the bedroom, you could also use it as an installation for pots and pans over your kitchen sink, swapping the clothes hangers with some beautiful vintage meat hooks from a butcher. If this has got you in the mood for trying your hand working with wood a bit more, then do check out this book - Woodworking by Andrea Brugi and Samina Langholz. Published by Jacqui Small, an imprint of The Quarto Group (£20). Out 22nd March 2018. Pre order now. Christmas is a wonderful time of year, full of cherished moments with family and friends and lots of fun and festivities. Yet, it is also a time of year that creates incredible amounts of waste that has a huge impact on the environment. In the UK alone 1.5 billion Christmas cards are thrown away annually according to Imperial College research. Astonishingly 226,800 miles of wrapping paper, which is enough to stretch nine times around the world, ends up in landfill; along with 125,000 tons of plastic wrapping. Also, most Christmas decorations like tinsel and baubles are made from plastic, which is a huge environmental problem and will end up forever in landfill or the ocean. Plus, I know everyone loves a sparkly Christmas, but don’t forget that glitter is actually a micro-plastic, the worst kind of plastic. It currently accounts for 85% of plastic found in the environment and it is so small that tiny organisms, especially aquatic life, can consume it. Therefore, through the food chain, it eventually ends up back on our plates. So if you prefer your seafood plastic free, read on for some fun, beautiful and earth-friendly ways to decorate your Christmas table or your home for the festive season. The Neutral Look - This calm and delicate table combines natural grasses with paper, linen and ceramics to create a muted, textural look. This might be the most complicated table, but definitely worth a go and of course you can pick and choose which elements to recreate. Table covering: Lay a linen tablecloth (this one is from Griege). Investing in linen is something you will always value. It actually gets better with age, so you will quite possibly end up handing it down to your children. Environmentally, it’s also a much better option than cheap polyester as when polyester is washed it releases microfibers into the water, which then ends up in our precious oceans. Place settings: These beautiful handmade ceramics are from London-based designer Andrea Roman. I love collecting handmade plates and bowls as over time it means you have a kitchen filled with unique treasures. You are also supporting local businesses and investing in life-long pieces which results in less waste and feel good vibes all round. Centrepiece: Arrange paper book trees down the middle of the table in alternating sizes. Have a 'making party' with friends and some mulled wine, and grab some old paperback books, any will work. If you don’t have any books in your own collection that you no longer use, pop to your local charity store & pick up a few for pocket change (while also benefiting a charity). Simply follow the easy steps on this video to make. Finish off by topping the trees with a star, find out how to make these - First step here. Second step here. I also made some paper snowflakes and baubles - you can cut these from scrap paper, old Christmas cards or used packaging. Watch this video on how to fold and cut out a snowflake and this post for instructions and a printout for the baubles. Adding texture: I am a huge fan of foraging and harvesting what is growing in the garden or around my local area. Gathering locally means you’re not buying flowers that have travelled hundreds of air or land miles and have also most likely been sprayed with pesticides. It also means you’re cutting out the plastic they come wrapped in. So grab your secateurs and head out for a walk, enjoy the fresh air and see what lovely foliage you can find. To create this eye-catching hanging centrepiece I used Pampas grass which grows wild and free around the UK and has these beautiful fluffy plumes from October to February- perfect timing for the festive season. Using cotton yarn I tied the pampas grass stems to a bamboo stake and then hung the it from the roof rafters. Alternatively, if you can’t hang them, throw a big bunch in a tall vase for a striking centrepiece and enjoy their feathery wild loveliness. I then picked apart small pieces of the grass and laid them around the bottom of the paper trees and on each plate. The Colourful Look - This table is super easy and quick to create and will add a huge amount of vibrant colour, texture and rustic charm to your table. Table covering: Use a roll of recycled paper as a table runner. This serves multiple purposes; 1) it uses recycled paper, 2) it protects your table from food and spills, and 3) it makes clean up super quick - just roll up and put into the recycling (although if your lucky enough to have very clean dinner guests you can keep the paper and use for something else like wrapping presents). I used a roll from Paperchase. Centrepiece: This step is by no means essential, but if you can get your hands on some tree slices they add a lovely rustic touch to your table. Look out for them at your local flower markets or nurseries or keep your eyes peeled for tree-chopping neighbours and ask for some trunk slices! As well as being pretty, they also serve as trivets to protect your table from hot dishes. We then added a stunning handmade salad bowl from Ghaz Ceramics to the centre of the table. Feel free to use any fruit or salad bowls you love. Add foliage and colour: Again, go foraging for some foliage - this time you’re on the look out for greens - especially pine, to give that extra Christmassy feel. It also smells beautiful! Lay small branch pieces in alternative directions down the middle of the table. For colour, add some seasonal produce- pomegranates, clementines, persimmons and artichokes are all in season this time of year and perfect for the table! I even used some pink radishes to add further pops of colour! Any type of hardy, thick-skinned fruit or vegetable will work. Just don’t put anything soft like berries on the table as it won't last. Scatter and nestle it all amongst the pine. Place settings: Once again, I'm advocating the investment in locally made ceramics. These beautiful plates are by Edmund Davies. A trick to slowly building a collection - buy all your plates in neutrals and whites, so that even if they are all from different makers they will mix and match beautifully. Add a pomegranate (or clementine) on each plate to add more colour. If you want to designate seats you can always write names onto the pomegranates as cute ‘place cards’. If buying new glassware, again please consider buying handmade to benefit artisans and the planet. These glasses are from Greige and are handmade in Portugal and come in all sorts of colours. Otherwise if you don’t have enough glassware for everyone, head to your local charity shop where you will find many bargains and then mix and alternate the different glassware along the table (same goes for cutlery). After your meal, do not throw away your decorations, as you can eat them! Give your guests a little bagful to take away too. The Dark Look - This table is great for a moody dinner setting and again is super simple to create. Table covering: Opt for a dark coloured tablecloth - again try to opt for a linen or cotton tablecloth instead of cheap polyester. Try Greige for some lovely table linen. Centrepiece: In the UK alone we consume 35 million bottles of wine over the festive season so this is a way to re-use some of these (and not just for Christmas). Collect bottles in varying colours and shapes, then soak in hot water to remove the labels. Wedge in some taper candles - if the bottle opening is a bit small, melt down the ends a little then twist in. To get the drip effect you just need to let the candles burn down and drip. Then simply re-fill with new candles when needed. Finally, nestle some foraged pinecones around the wine bottle candles. Place settings: For this one I have created a more formal setting and layered dinner plates with entrée plates and soup bowls plus linen napkins for extra texture, all sourced for Greige and Ghaz Ceramics. Again don’t be afraid to mix and match your plates and bowls - just adhere to a similar colour palette and it will work beautifully. We hope these ideas might have inspired you in some way! If you do create anything inspired by these ideas we would love to see - so please tag @91magazine and our stylist @laurenbeckerstylist. Many thanks to all the lovely makers and local shops that got involved in the project. We absolutely love collaborating with cool brands that we love and think you will love too. In the new issue we teamed up with We Are Knitters and Melody Hoffman to showcase a couple of We Are Knitters gorgeous knitting kits. We opted for two kits from their homeware range, but you can also pick from their cosy garments range, perfect for whipping up some great Christmas gifts or just to keep yourself snug this winter. Even if you are a knitting novice, never fear, as the kits provide you with everything you need to give it a whirl, and they are categorised into skill levels so you can start off easy and progress if you wish. To celebrate our collaboration the lovely folk of We Are Knitters are offering one 91 Magazine reader the chance to win the sleepy blanket kit as featured in the magazine! The kit is worth £99 and the winner will be able to select their preferred colour of wool. So, to be in with a chance of winning, all you need to do is enter your details below. A winner will be drawn at random after the closing date which is 8th November 2017. Please see below for further terms and conditions. 1. Only entries made before the closing date - 8th November 2017 will be valid. 3. The winner will have until 24th November 2017 to respond with their chosen wool colour and delivery address. If a reply is not received by this date, they will forfeit the prize and a new winner will be chosen. 5. The giveaway is open to worldwide entries. 6. By entering the giveaway and providing your email address you are giving permission to be added to the mailing lists of both 91 Magazine and We are Knitters. Your details will not be shared with any further third parties. This post was sponsored by We Are Knitters. Images by Melody Hoffman for 91 Magazine. Our AW17 issue arrives at 91 HQ tomorrow! If you were quick off the mark and were one of the first 200 people to order a copy you will also receive a 40cm x 40cm piece of fabric, designed by Nancy Straughan. It will be a lucky dip as to which pattern you will receive, but they are all really beautiful, so we hope you will love what you get inside your envelope. We urge you to use your creativity to turn your piece of fabric into something lovely, but here are a few ideas to get you started! FABRIC GIFT TAGS - A gift is always made that little bit extra special with beautiful wrapping, and fabric gift tags are a great way to add an element of tactility and luxury. These are SO easy to make. 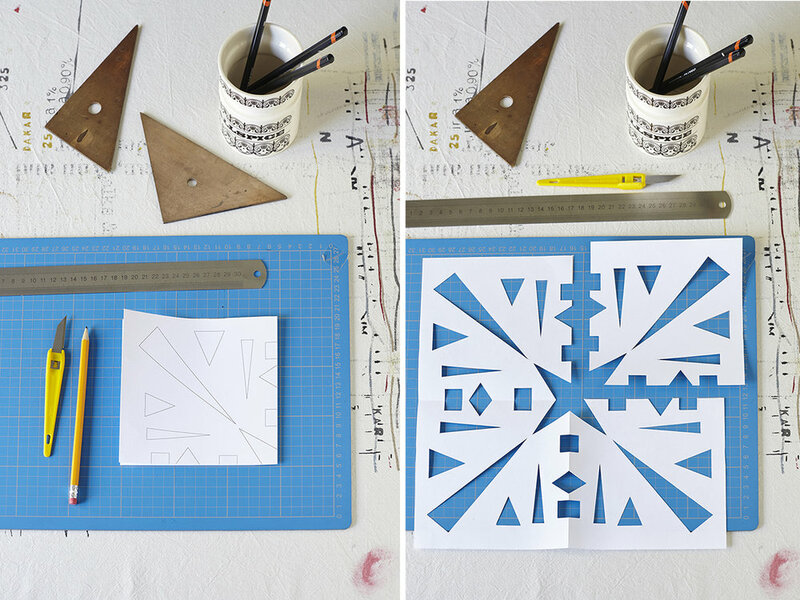 Lay a rectangle of fabric atop some thick paper or card, and cut both to the same size. Use craft glue to stick the fabric to the card, and allow to dry. Use pinking shears to trim to size with a zig-zag edge which looks great & also stops the fabric fraying. Fold the tag in half lengthways and use sharp scissors to cut a small hole to feed your string or ribbon through. Add a sprig of eucalyptus for perfectly stylish Christmas wrapping. You should be able to make approx 8-12 tags with your square of fabric, depending on the size you go for. 35cm x 35cm CUSHION COVER - Your square of fabric is just the right size to make a 35cm x 35cm cushion cover. Pick a plain coordinating fabric for the back of this simple envelope cover. Cut your Nancy Straughan piece of fabric to 38cm squared, and then the two pieces from your backing fabric at 38cm x 31cm and 38cm x 20cm. It helps to make a template from paper (brown or wrapping paper is best) and then pin your fabric to the paper and cut out. Sew a seam along one of the long edges of both of the backing pieces (ideally on a sewing machine) which will be the opening for the cover, then place the front and back pieces right sides facing together. Then sew around all four edges. Turn your cushion cover the right way out, and add a cushion pad! FABRIC PENNANT - Add some pattern to your walls with these mini fabric pennants, or make lots to create a garland. Simply cut out the flag shape from your fabric and sew a hem around each edge, leaving a channel along the top edge. You can use a thin piece of wooden dowling to feed through the channel, or simply thread through some string or twine to hang. That's just a few simple ideas for transforming your fabric square, but we'd LOVE to see what you do with yours! Please share pics via Instagram with the hashtag #91magXnancystraughan and we *may* award a prize to our favourite! Thanks again to Nancy Straughan for providing 200 pieces of fabric as our gift to the first 200 pre-orders of 91 Magazine AW17. If in doubt, use plants. Nearly ever vignette on the whole of Pinterest has at least one house plant in it! And some have lots. If you go with a selection, then opt for plants of different heights, and make sure to put them in complimenting pots. Books are essential. This is why books will never die out. As well as the fact that reading something in print is much more superior, they are also an essential item for styling! Whether you use a few of your favourite lifestyle books or some of those gorgeous classics with the pretty covers, they are great for adding height to a display. Furthermore, dependent on the books, there's the potential for injecting colour and pattern into the vignette too. Scale is of utmost importance. On a small bedside shelf like this, it cries out for small decorative items to adorn it. There is still a variation in scale here, but overall everything is quite petite. Trying to squeeze a large framed print, or a big plant pot on here would look hugely unbalanced. Consider the colour palette. A great colour palette is the secret to any great interior, let alone a great vignette! Keep this in mind when selecting the items you are going to display together. These natural earthy tones all work so well and also contrast with the sleeker green unit. But of course, have fun with it too, and feel free to throw in a pop of neon like in the bedroom shelf image above. Use artwork as a backdrop. Your vignette will look a bit flat without giving it a bit of depth, and one way to do this is by casually leaning a framed print or photograph against the wall, or hanging it (or them) just above. Mirrors are also a good option, or you can simply tape a few favourite postcards or pictures to the wall, and change them around as and when. Trial and error is key. The best thing about creating vignettes is nothing is permanent. It's not a big decision like paint colours or choosing furniture, so just have fun with it and try different things. Play with scale, vary height, test out colour combinations, add things, take things away.... Try taking photos of different arrangements and then compare to see which works best visually. For more inspiration for your vignette styling, pop over to the 91 Magazine Pinterest page. It certainly doesn't look like the trend for houseplants is going away any time soon does it?! If anything, more and more of us just keep on growing ('scuse the pun!) our plant collections. It's more than just popping a few cacti on the windowsill and an aloe vera in the bathroom, we are creating actual indoor jungles inside our homes! They seem to have taken on an interior genre all of their own, with people hunting out the more unusual species, shopping for beautiful pots to display them in, and even learning new crafts, like macramé, just to be able to create gorgeous hanging planters. And of course how you style them is as important as how you care for them (naturally!) - so we've been pinning some interiors where they've got it just right with their plant styling. Head over to our Pinterest board for more inspiration. As much as we LOVE to shop here at 91, we also enjoy making our own home accessories once in a while, especially if they turn out as beautifully as this cushion cover designed by Joy Jolliffe (owner of Random Retail). Thankfully Joy isn't keeping this one to herself, today she shares a tutorial for creating your very own version of this beauty for your sofa or dining chairs. Take it away Joy! The inspiration for this idea began with torn paper. 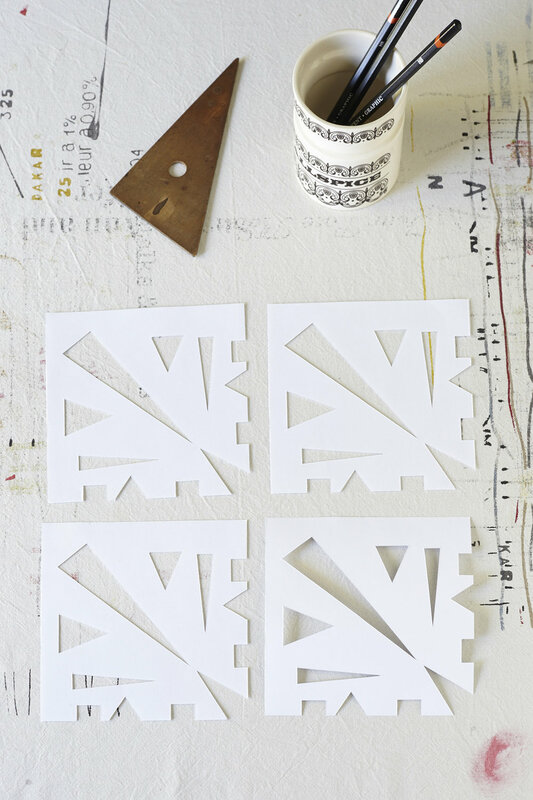 The snowflake designs that we all made when we were children can be a good starting point for pattern ideas. I also have a small collection of vintage wooden set squares and it was their straight edges and triangular shapes that suggested the idea for a geometric design. Celtic designs and patterned tiles are also great inspiration for this type of look. 1. 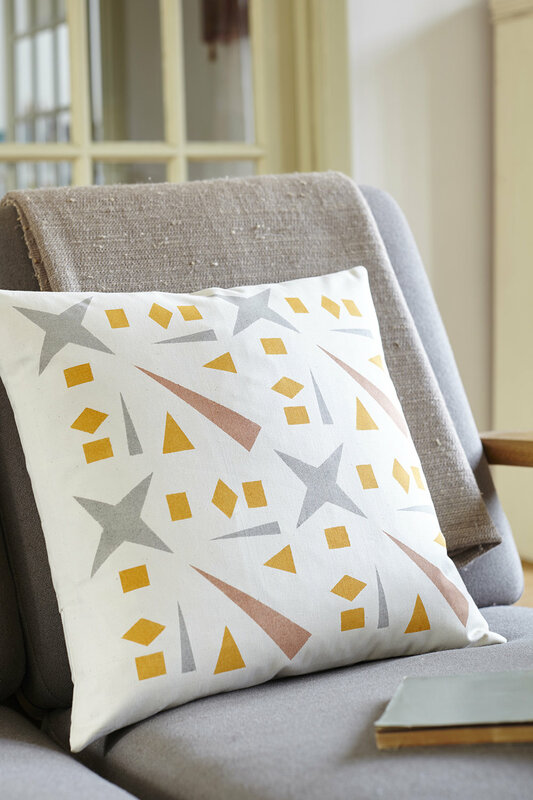 Fold a square piece of paper (that measures the same size as your cushion cover) into quarters and draw your geometric design out as above left. Cut out carefully with a scalpel. Unfold the paper. 3. Next you need to decide which colours you will use and where. Keep it simple with two or three colours. By reverse tracing transfer each colour group onto three separate pieces of card and cut out each stencil ready for printing. It's important to cut small matching holes in the corner of each stencil - this gives you registration points to ensure the 2nd and 3rd stencils are positioned correctly. ** SPONGEING TECHNIQUE TIP ** For this design I used a sponge to transfer the ink onto the fabric. It’s a good idea to practice on a spare piece of fabric before starting on your cushion. Dab the sponge onto the ink and then dab off onto a clean part of the plate before applying the inked sponge to the stencil. That way you can build the colour gradually and avoid blobs and blots. ** PRINTING ON READY MADE CUSHION TIPS ** If you are printing onto a ready made cushion cover, arrange your design so that it avoids seams or zips/closures/overlaps. It’s always best to print onto a flat surface. Additionally, if using a ready made cushion cover, place a sheet of paper inside between the front and the back. This ensures ink doesn’t spread to the back during printing. 4. Tape your cushion cover or fabric onto a lightly padded surface. Tape the first stencil into position and using the Mark & Erase pen mark the 4 corner registration dots onto your fabric, then start spongeing on your ink. 5. When you have stencilled all of the 1st colour, remove the stencil carefully. Leave your fabric to dry, preferably in situ. Using your registration holes and marks, tape the 2nd stencil into place and apply the 2nd colour. 6. Repeat the last step with your 3rd colour to complete the design. Allow to dry, then either stitch your fabric to make up the cushion cover, or simply pop in a cushion pad if you used a ready made cover. Design and tutorial by Joy Jolliffe of Random Retail. Find more of Joy's printing designs and techniques in her book Print it! There’s no denying there is a big botanical trend going on just now. As nature accelerates out of the cold dark winter months, it certainly seems appropriate that we embrace it and celebrate it, by creating a wonderfully green and lush Easter table. The natural scheme is inspired by spring’s rebirth with buds popping, leaves unfurling and birds singing. It’s time to make your interior sing too; bring the outside in, get up close, smell the flowers and emphasise the detail with this woodland theme. It’s a simple, eclectic look, which just needs a little preparation in advance, then style by layering up the rustic elements and items you already have around the home. You can make these the day before from seasonal plants like pansies, primroses or ranunculuses. You will need moss from the garden or sourced from a florist, floristry wire and wire snips. Half an hour before you start, water the plants, then leave to drain. Green side down spread some moss out in a rectangle large enough to cover the plant pot. Take the plant out of the pot, pull off the loose soil, press the roots into a ball shape, and wrap the moss around the soil. Wind wire in all directions around the moss making a firm ball. Snip the wire and press the end into the moss ball. · Dress up simple white ceramics by placing on rustic chopping boards, if you need extra, borrow from friends or family. · Mismatched vintage or contemporary ceramic candlesticks look great with ordinary white household candles. · Make rustic bread rolls special by wrapping with a collar of brown paper, held in place with twine. · Write your guests' names on simple luggage tags, then add a sprig of blossom. · Speckled chocolate eggs in decorative nests (try Waitrose, Tiger or online craft stores for these) scattered with feathers add authenticity to your woodland theme and also are a treat for your younger (and older!) guests. · For a last minute finishing touch, drape a few trails of ivy. After your celebrations, give the kokedama a long drink, drain, then group around the house or in the garden. Better still, give your guests a parting gift of a moss wrapped kokedama plant to remind them of a perfect celebration. 1. Keep it natural - What normally accompanies your cup of tea or coffee? A good book or magazine? A snuggly blanket? a biscuit? Style your drink alongside the items that naturally go hand in hand. Yes, it may be meticulously styled and set up to get the right light, but you'll likely still enjoyed your tea under that snuggly blanket afterwards! 3. Style a meal time - using food in your shots always works well, so incorporate it into your cuppa pics and create a breakfast, coffee break or afternoon tea scene. The easiest and most enjoyable way of doing this is to actually make your meal or break time this beautiful! Perhaps opt for a weekend morning when you have the time to clear the table of daily life admin, pop some blooms in a vase, and select some pretty food and crockery to include. Use a photo worthy surface or lay a tablecloth, then shoot your pics before your breakfast date tucks in! 4. Make your props relevant - a photo styling tip that has stuck in my head for a long time is about making your props relevant. Whether it's a cup of tea or a product you are selling, selecting props that are actually used in it's production make the scene more authentic. Scatter tea leaves or coffee beans, incorporate (attractive) packaging and include other tea making paraphenalia such as the teapot, strainer, teaspoon and sugar cubes. Keep your eyes peeled for vintage, design-led or handmade versions of these objects which you can keep in your prop box. 5. Embrace simplicity and negative space - You don't necessarily need to fill every inch of your frame; opting for a serene scene which takes advantage of negative space can be just as eye-catching. Play around with the composition to find the most pleasing arrangement, consider the object spacing and don't be afraid to allow your crop to cut through some of the props. 6. Use foliage and flowers - I wonder what percentage of Instagram images ever posted include flowers or plants?! Well they just look so blinking great don't they?! Tea and flowers are definitely a combo that not many of us would turn down, so they inevitably pair well in pics too. There are so many ways to incorporate your greenery or blooms - lay a posy or single stem flat, or in a vase, scatter petals or allow foliage to creep into frame - simply play around to see what works best. Plants and flowers help to bring life to your images and soften hard surfaces, and generally help to prettify everything! 7. Include yourself - Another way to bring life to your images is to feature yourself! Don't worry if you are camera shy - I'm talking hands and (nicely pedicured!) feet - although of course seeing the faces behind IG accounts is always welcome! A hand stirring in the milk, or cradling your warm drink adds a human element to your images, plus you get to show off that lovely new nail colour you've discovered! pretty food - cake, pastries, fruit, etc. March is here! The month when it officially starts to feel like winter is behind us for another year, and we feel optimism and excitement for leisurely evenings enjoying the extra light and warmth. It's at this time of year I feel a real sense of 'fresh start' - much more than I do at the beginning of the year. Spring flowers are definitely some of my favourites - delicate narcissus, simple tulips and papery ranunculuses are perfect for indoor displays, while camelias, magnolias and blossom are starting to bloom outdoors. It feels so refreshing and invigorating to be able to fling open the windows and doors to the house and not feel an icy blast, but instead a soft breeze, dappled with the sound of bird song and children playing. Take your coffee into the garden, and sit quietly or have a potter and simply breath in the tranquility that a Spring afternoon can bring. The comfort that hearty winter food brings is replaced with the need for fresher, lighter meals - if you're lucky you may have some edible flowers in your garden, which make for a seriously pretty salad! And what could be better than an early evening bike ride, perhaps catching the sun setting on your return? Only improved by coming across a scene like this! What's your favourite thing about spring readers? We'd love to hear! Plus, pop over to our Pinterest page for more Spring inspiration. As well as a shared love for interiors and creative living, it turns out that nearly all of the 91 Magazine team have a passion for all things yarn. Our sub editor Kath is a whizz with both knitting needles and a crochet hook, designing patterns as part of her work, while Lucy, our designer, is a general craft genius, but in particular hosts weaving workshops around the country. Myself and deputy editor Laura both enjoy a knitting project to unwind away from the computer screen. It's true that knitting is a skill that you need to acquire, but it's not a difficult one, and with the abundance of online tutorials these days it's even easier to learn the basics in an evening. If you are unsure of what to make, or what type of wool and needles you'd need, then We Are Knitters are the perfect place to discover some gorgeous projects both to wear and to accessorise your home with. Their kits range from beginner level to advanced and come with everything you need to get knitting straight away. As design lovers here at 91, we are naturally drawn to their super stylish branding (very Instagram-able! ), the lovely wooden needles and the beautiful yarn colours available. I am currently making the Dudo scarf which uses The Meri Wool in salmon pink - the perfect accessory for a nippy spring day I think. Whether you're a seasoned knitter or a complete novice, we think you'll be excited to hear that we have teamed up with We Are Knitters to offer one 91 Magazine blog reader the chance to win £150 to spend on their website! That should get you 2-3 of their kits to try out, or if you are an advanced knitter you could stock up your yarn supplies very well indeed! 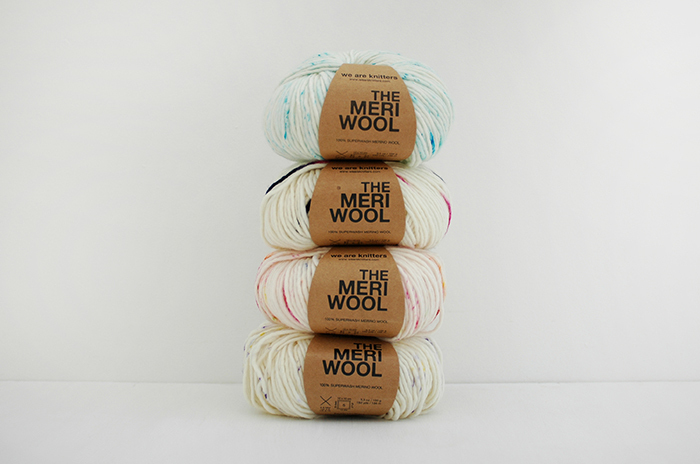 We are loving the 'sprinkle' version of the Meri Wool above. They also offer crochet and macramé kits too, so you could try out a few different crafts if 2017 really is your year of learning new things! The giveaway is open to UK based readers only, and the closing date is 10th March 2017. A winner will be selected at random and We Are Knitters will contact you directly if you are the lucky one. Do pop over to the We Are Knitters website to have a browse at what you might be able to bag yourself! This post has been sponsored by We are Knitters. All images and opinions are those of Caroline Rowland, editor of 91 Magazine.